SPARKS, Okla. - Oklahomans more accustomed to tornadoes than earthquakes suffered through a weekend of temblors that cracked buildings, buckled a highway and rattled nerves. One jolting quake late Saturday was the state's strongest ever and shook a college football stadium 50 miles away while another of lesser intensity struck before dawn Sunday. "That shook up the place, had a lot of people nervous," Oklahoma State wide receiver Justin Blackmon said of the late Saturday quake, the strongest of a series of quakes that began hours earlier. "Yeah, it was pretty strong." A magnitude 5.6 earthquake Saturday night was centered near Sparks, 44 miles northeast of Oklahoma City, and could be felt as far away as Tennessee and Wisconsin, according to reports received by the U.S. Geological Survey. A magnitude 4.7 quake early Saturday was felt from Texas to Missouri. The Survey said the latest quake hit at 3:39 a.m. Sunday, measuring 4.0 in magnitude and centered 36 miles east of Oklahoma City. Like Saturday night's quake, it said, the quake Sunday took place a little more than 3 miles underground. There were no immediate reports of serious injuries or major damage from the quakes or many small aftershocks, but a number of homeowners and businesses reported cracked walls or fallen knickknacks. At Shawnee, the fire department said one spire on the administration building at St. Gregory University had been damaged and another one was leaning, according to KWTV in Oklahoma City. "Earthquake damage in Oklahoma. That's an anomaly right there," Todd McKinsey of Moore told The Oklahoman newspaper after a magnitude 5.6 temblor centered 50 miles away left him with cracked drywall. Oklahoma typically has about 50 earthquakes a year, and 57 tornadoes, but a swarm of quakes east of Oklahoma City contributed to a sharp increase in the number of temblors. Researchers said 1,047 quakes occurred last year, prompting them to install seismographs in the area. A cause of the uptick wasn't known. Saturday night's earthquake jolted Oklahoma State University's stadium shortly after the No. 3 Cowboys defeated No. 17 Kansas State. The crowd of 58,895 was still leaving when it hit, and players were in the locker rooms beneath the stands at Boone Pickens Stadium. The temblor seemed to last the better part of a minute, rippling upward to the stadium press box. "Everybody was looking around and no one had any idea," Oklahoma State quarterback Brandon Weeden said. "We thought the people above us were doing something. I've never felt one, so that was a first." An emergency manager in Lincoln County near the epicenter said U.S. 62, a two-lane highway that meanders through the gently rolling landscape between Oklahoma City and the Arkansas state line, crumbled in places when the stronger quake struck Saturday night. Other reports in the early hours Sunday were sketchy and mentioned cracks in some buildings and a chimney toppled. The magnitude 4.7 earthquake that struck the area early Saturday  and a number of aftershocks following both large quakes  rattled homes and businesses, but emergency officials said no injuries were reported and that there had been no immediate reports of major damages. "Nothing is destroyed or anything like that," Prague City Police Department dispatcher Claudie Morton told the Tulsa World after the Saturday morning quakes. But authorities said they would need to await daybreak for better light to assess any damages from the later, more powerful quake. Hours before dawn on Sunday, the latest quake set nerves on edge anew. At the Prague Community Hospital in the region, registered nurse Jessie Plumb said no injured people had come into the emergency room after the late Saturday quake. But she said she and other hospital staffers felt the 4.0 magnitude quake early Sunday while on the second floor of the building. "It kind of gave a little bit of a shake, a little bit of rock `n roll," she told The Associated Press by phone. "I would say it was 20 or 25 seconds." She said she worried because of the number of quakes and the intensity. Saturday's late-night quake was slightly less in intensity than a temblor that rattled the East Coast on Aug. 23. That 5.8 magnitude earthquake was centered in Virginia and was felt from Georgia to Canada. No major damage was reported, although cracks appeared in the Washington Monument, the National Cathedral suffered costly damage to sculpted stonework, and a number of federal buildings were evacuated. 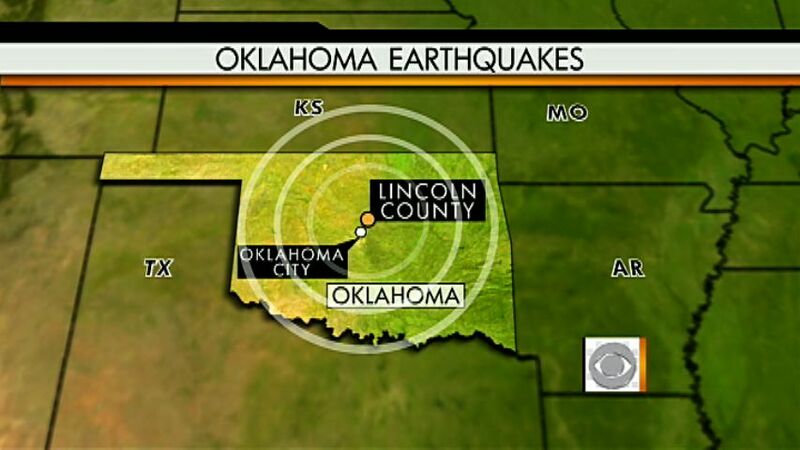 If the 5.6 magnitude from Saturday's late quake is confirmed, it would be Oklahoma's strongest. USGS records show that a 5.5 magnitude earthquake struck El Reno, just west of Oklahoma City, in 1952 and, before Oklahoma became a state in 1907, a quake of similar magnitude 5.5 struck in northeastern Indian Territory in 1882. "Oh, man. I've never felt anything like that in my life," Morton told the Tulsa newspaper. "It was the scariest thing. I had a police officer just come in and sit down and all the sudden the walls started shaking and the windows were rattling. It felt like the roof was going to come off the police department." Morton said the office was flooded with calls, but no one reported any severe injuries or damage. She said residents told her that picture frames and mirrors fell from walls and broke, drawers worked loose from dressers and objects tumbled out of cabinets. "We do have several damaged buildings downtown, but it's just cracks and things like that," Morton said. Oklahoma Geological Survey researcher Austin Holland told Oklahoma City television station KOTV that the earthquake and aftershocks occurred on a known fault line. Residents in Prague and Sparks felt an intense shaking, but for those farther away the quake was more of a dull rumble, he said. "It shakes much more rapidly when you're closer to it," he said. "Because it's a large earthquake, it's going to rumble for a while."